Small businesses throughout the Commonwealth will have expanded access to high quality business support services thanks to recent funding approved by the Massachusetts Legislature and Governor Patrick. The FY 2014 Supplemental Budget bill recently signed into law includes $2 million for the Small Business Technical Assistance (SBTA) program administered by the Massachusetts Growth Capital Corporation (MGCC). The funding appropriation follows a major campaign led by MACDC and its members to secure stable funding for this highly successful program. The SBTA program was originally created in 2006 with an appropriation of $2 million in that year’s economic development legislation signed into law by Governor Romney. A few months later, then-candidate Deval Patrick promised at the MACDC Convention that he would fund the program in his budget every year, for each of the two terms he hoped to serve. For seven years, Governor Patrick was able to keep that commitment, even during the budget challenges spawned by the Great Recession. Since 2010, the Governor has funded the program off-budget with MGCC capital, but now for the first time in several years, the program will be fully funded through state appropriations. Eight years later, the Governor’s pledge as a candidate has been fulfilled. Such funding is well deserved given the outstanding track record of this program. Last year, MGCC allocated $700,000 and achieved a tremendous return on investment with more than 900 businesses receiving help with business plans, financial accounting, marketing, permitting and access to capital. These businesses created nearly 500 jobs and preserved another 300 jobs. One of those business owners, Josiah Mayo, co-owner of Chequessett Chocolate on Cape Cod, spoke at MACDC’s Lobby Day last month. With an increase in funding, MACDC is confident that these numbers will be even higher next year. The success of this campaign is due, in no small part, to the amazing champions we had throughout the legislative process. Representatives Kulik, Peake, and Wagner played leadership roles in the House, while Senators Flanagan, DiDomenico, Donaghue, and Dorcen Forry led the charge in the Senate. Dozens of other elected officials also weighed in at critical moments. And, of course, this funding would not have been achieved without the support of Rep. Brian Dempsey, Chair of the House Ways & Means Committee, Senator Stephen Brewer, Chair of the Senate Ways & Means Committee, Speaker Robert DeLeo, and Senate President Therese Murray. MACDC also recognizes the terrific work done by our members and other nonprofit organizations that held dozens of meetings with their legislators both in their districts and during the MACDC Lobby Day on April 16th. MACDC also greatly appreciates the highly professional advocacy work done by our colleagues at O’Neil & Associates, Matt Irish and Chris Niles. They helped shepherd this proposal throughout the legislative process. Update: The Jamaica Plain Forum recognized MACDC's successful campaign in a recent e-newsletter. On Monday, June 2, 2014, the Massachusetts Housing Investment Corporation will honor three MACDC members – Harborlight Community Partners, Homeowners Rehab and Urban Edge – with “Excellence in Community Development” awards at MHIC’s annual meeting. The executive directors from each organization will be on hand to receive the award, which recognizes the honorees’ enthusiastic and exceptional commitment to community development. The annual meeting will take place at the Omni Parker House Hotel in Boston. A full list of past Excellence in Community Development Award winners can be found on MHIC's website. Denise Coyne, COO of Greenfield Savings Bank, celebrates with John Waite, Executive Director of Franklin County CDC, their increased support of Franklin County CDC through the CITC program. With the CITC program, Greenfield Savings Bank tripled their contribution from 2013 to Franklin County CDC. 1. Last minute legislative changes made the program stronger: MACDC’s original legislative proposal called for the tax credit to begin in January 2013 with $2 million in credits, then $4 million in 2014 and $6 million in 2015 and beyond. The Legislature modified the plan by providing $1.5 million in start-up grants for 2013 and then $3 million in tax credits in 2014 and $6 million in 2015 through 2019. While Governor Patrick cut the grants to $750,000 (demonstrating one of the key advantages of tax credits over appropriations), the start-up grants did allow DHCD to put resources into the community quickly so that CDCs (and MACDC) could engage in critical planning and preparation work prior to the roll out of the tax credit program. The Legislature also modified our proposal, at the recommendation of the Department of Revenue, to make the credits refundable rather than transferable – simplifying the program tremendously and expanding the range of potential donors. I wish we had thought of these ideas ourselves, but we are thankful that the Administration and the Legislature made the program even stronger. 2. Rolling out a new program takes time: The Legislature was also wise to delay the implementation of the tax credit until 2014 because we needed every one of those extra months (and then some) to get the regulatory infrastructure in place. Both DHCD and DOR had to develop regulations and guidelines for this new program and it has taken significant time to do so. While I think things could have moved faster, I have come to accept the reality that bureaucracies move slowly for a reason and that tax credits need to be designed carefully to avoid unintended consequences. Creating a fair application procedure, appropriate reporting requirements, and clear procedures for processing transactions has taken a while, but now that these things are in place the program should move forward smoothly. 3. Community Investment Plans Matter – The CITC is built around the requirement that DHCD award tax credits based on the quality of the Community Investment Plans submitted to DHCD. The two most important elements in these plans, according to DHCD’s scoring rubric, are community engagement and organizational track record. Tax credit allocations ranged from $50,000 to $110,000, so it’s clear that the quality of the plan matters. Over time, we expect to see the quality of these plans improve, as well as the ability of CDCs to execute their plans and measure results. We will begin to see how this is playing out with the second CITC RFP later this year and the first year reports in 2014. 4. CITC is pushing CDCs and MACDC to sharpen our message: One of the reasons that we structured this program as a tax credit for private donations was to incent and reward CDCs to become more effective at telling their story. Over the past year, we have held several trainings on this topic and we have seen CDCs invest in new marketing materials, websites, and data systems. MACDC itself developed a new “theory of change” to more effectively talk about the diverse work of our members and we completely revamped our website. 5. Large corporations seem less interested than small businesses and individuals: So far, the major financial institutions that have been the field’s biggest private supporters have not yet jumped into the CITC pool. These national banks don’t yet have the systems in place to allocate the future tax savings back to the local philanthropy budget. By contrast, community banks, smaller businesses and individuals have an easier time seeing the tax benefits and translating those benefits into larger donors. That said, the first large financial institution to figure this out will have a major competitive advantage over the others. Who will that be? 6. CITC opens doors and ears, but will it open wallets? For the past year, MACDC has been reaching out to donors, donor advisors, accountants, lawyers and others to educate them about the tax credit and how it can help high net worth individuals and companies increase the impact of their philanthropy. We have found many of them to be very interested in this new tool and we have met with dozens of people who might otherwise not be that interested in hearing our pitch. The question remains whether these meetings and conversations will translate into actual donations, but we are optimistic that CITC will achieve one of its key goals – attracting new donors to the field. 7. Different strokes for different folks: Much as we expected, CDCs are deploying different strategies to find donors to use their credits. Some CDCs are focusing on smaller individual donors, others on larger, five-figure donations; some are looking to community banks while others are talking to construction companies, law firms and other vendors active in the field. 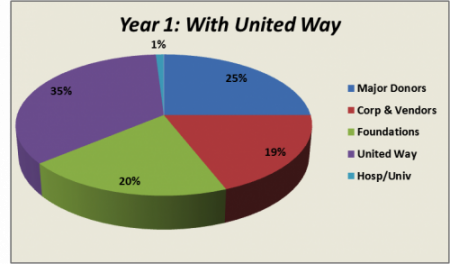 While most CDCs transferred the maximum of 50% of their allocation to the United Way’s Community Partnership Fund, several others transferred less or none of their credits – confident that they can find enough donors to use all of their credits (a total of $1.1 million was transferred, giving the United Way the opportunity to raise $2.2 million). Many CDCs are using credits to enhance sponsorships and donations associated with annual meetings and fundraising galas. Perhaps the most challenging question for CDCs has been whether to focus on getting existing donors to step up with larger donations or whether to take the extra time to solicit new donors – or some combination of both. We have also been pleased to see many CDCs engage their board members in this process, providing them with training on how to raise money and in one case, having the board run a “phone-a-thon” to call over 100 prospects in a single evening. The CITC program is very much a work in progress. We should expect some confusion and even some stumbles, but I remain confident that over time the program will become easier and more predictable to use (for donors and CDCs alike) and that it will have the desired impact of meaningfully improving communities and the lives of the people who live there. A ribbon cutting ceremony was held on May 13, 2014 to mark the completion of the beautiful, $9.8 million Benfield Farms development in the Town of Carlisle. The ceremony marked the culmination of more than 10 years of work by the community and the first affordable project in more than 34 years. The long-awaited development of Benfield Farms, 26 units of affordable, age-restricted rental homes, is especially important to many seniors who need affordable housing in order to stay in their community. NOAH (Neighborhood of Affordable Housing, Inc.), the Carlisle Housing Authority and the Town of Carlisle Affordable Housing Trust Fund collaborated for five years to plan the sustainable housing community located at 575 South Street in Carlisle. The project began construction April 2013, was completed in February 2014 and began occupancy March 1, 2014. It brings the town full circle from the decision to buy the land in 2004 to occupancy in 2014. Benfield Farms is a bucolic 4.4-acre site framed by wetlands, an open meadow, and forest, located on the scenic road of South Street, about two miles from the center of Carlisle, a small rural community. The 26 units, in 28,160 square feet, are a mix of 17 one-bedroom units and nine 2-bedroom units that will be rented to households over the age of 62. These efficient apartments utilize the principles of universal design for seniors and the latest in energy efficiencies to provide climate control and lower energy costs. The building has three meeting spaces, an exercise room on the second floor, and a library and porch on the third floor. Benfield Farms will be a model of sustainable development, thanks to the ongoing assistance of Kim Vermeer of Urban Habitat Initiatives. Working closely with the Town of Carlisle, NOAH planned the project to minimize its impact on the 45-acre site. The completed building is eligible for LEED for Homes Certifiable at the Gold level and will seek certification from USGBC. Benfield Farms uses less than 10% of the site, and is located near the road to reduce paving and other infrastructure. 100% of the storm water will be channeled away from wetlands and used to recharge groundwater. Landscaping is designed with native, drought-tolerant plants that will not require irrigation once established. An all-electric heating and cooling system provides high efficiency energy and, to save on the future costs of electricity, the project is investing in a solar PV system. NOAH, a 26-year-old nonprofit community development corporation based in East Boston and MACDC member, served as the developer. Throughout the process, NOAH worked with the design team of DiMella Shaffer Architects (DSA), civil engineers Meridian Associates, and general contractor Dellbrook Construction. Peabody Properties serves the property manager and leasing agent for the project. The 4.4-acre site will continue to be owned by the Carlisle Housing Authority, which holds a 99-year lease with Benfield Farms LP. Affordable housing would not be possible without the public-private partnership of the funding programs that combine federal, state, and local funds with private sector investment. NOAH obtained an allocation of federal Low Income Housing Tax Credits and other soft loans from the Department of Housing and Community Development (DHCD). Bank of America Merrill Lynch purchased both the federal and state Low Income Housing Tax Credits with close to $6 million in equity and a construction loan of $6,650,000. Mass Housing Partnership is providing a permanent mortgage of $1,450,000, which will go into effect once all the units are occupied. Town Community Preservation Act Funds were used as a $425,000 loan for the project in addition to the $2 million for the initial purchase of the Benfield property. No one said affordable housing is easy; it takes a supportive village, patient developers, and creative financing. Constructing affordable housing units is never easy, but it is always worth it. The Great Cove Community in Mashpee is a perfect example. In 2001, the first feasibility study for the proposed housing development took place. Thirteen years later, the project was completed, bringing 10 affordable rental units to the Upper Cape. Rick Presbrey, CEO of Housing Assistance Corporation, said during the ribbon-cutting ceremony last month that time should be taken to acknowledge the efforts that went into making the project a success. “First, we are celebrating the accomplishment here today, which is a big deal because these things take years, literally years to do,” he said. By all estimates, the wait was well worth it. Nearly two dozen people attended the event – Mashpee Town Manager Joyce Mason; Chair of the Mashpee Board of Selectmen John Cahalane; Leila Botsford, executive director of the Mashpee Housing Authority; and Nancy McCafferty of the Massachusetts Housing Partnership, were among the notables – and they were impressed with the quality craftsmanship that went into the townhouse units. Consisting of eight 2-bedroom units and two 3-bedroom units, Presbrey commented on their attractiveness. “It’s not too cramped and the inside of the units is finished exceptionally well,” he said. “I think the thing you noticed is the flooring, the colors of the wall, and the kitchen cabinets are really, really fantastically appealing… What has happened here is we have the right builder in The Valle Group that will not lower their standards for something like this.” Mashpee families will fill seven of the units and eight of the 10 will be dedicated to those who earn 30 percent of the area median income or less. Great Cove was funded and built through a collaboration of multiple local and regional agencies including the Mashpee Housing Authority, the town of Mashpee, HAC, the Cape Cod Commission and the Massachusetts Housing Partnership. The Yarmouth Port-based firm of Brown, Lindquist, Fenuccio & Raber Architects designed the units with The Valle Group of Falmouth, constructing them and Horsley Witten Group serving as the civil engineer and landscape architects. Located on Breezy Way off Old Barnstable Road, the development is located a few hundred yards away from Mashpee High School, which provided an additional benefit to the town. “One of the really unique elements of this project is not only does it increase the affordable housing stock on Cape Cod, but the town was also able to improve the water quality as well by connecting the wastewater discharge of this project to the existing high school,” Brian Kuchar of Horsley Witten said. To read more content like this, visit the Housing Assistance Corporation website (www.HAConCapeCod.org), follow them on Twitter and like them on Facebook. Urban Edge recently celebrated 40 years of “leading with our heart” by hosting an anniversary event for more than 350 friends, supporters and colleagues on April 30th. Held at the State Room in downtown Boston, the event featured Geoffrey Canada, President of the Harlem Children’s Zone, as the featured speaker and Charlotte Golar Richie as the emcee. Full lyrics and musician credits are available on Urban Edge's YouTube channel. Visit their website for more information on their programs.